Bent on winning a Pulitzer Prize, a journalist commits himself to a mental institution to solve a strange and unclear murder. Inside he meets more than he bargained for. Fuller masterfully charts the uneasy terrain between sanity and madness. 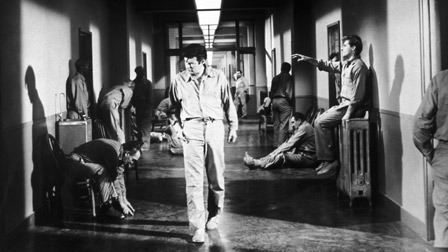 With its startling commentary on racism and other hot-button issues in sixties America and its daring photography by Stanley Cortez, Shock Corridor has had far-reaching influence on Martin Scorsese and many other filmmakers. (Banned until 1990 because it “presents a mental hospital in a light that would be considered objectionable in this country”).